Yes, the rumors about rural Alaskas plumbing (or lack thereof) are true. While all of the major cities, such as Anchorage, Fairbanks, Juneau and Seward, have basic waste services, community sanitation services are rare in rural Alaska, and Kennicott is no exception. While the Kennicott Lodge (about 1/3 mile from Seventeen Silk Stocking Row) does have indoor bathrooms down the hall from its guest rooms, we at Seventeen Silk Stocking Row made a decision to use a low-tech, ecology-friendly outhouse. 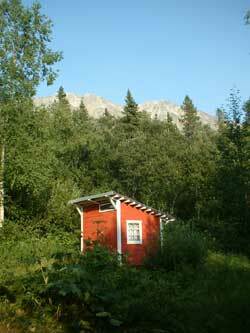 High time someone enshrined the outhouse in Alaskas archives! Perhaps no institution has contributed more to our democratization and development that this humble structure. Caring nothing for the creed, color, or social status of those whod seek solace within its portals, one moment it accommodates the gnarled nates of a trail-toughened bush rat; the next, with equal magnanimity, the billowing buttocks of one to the manor born. What other institution would accept without complaint the indignities to which the outhouse is subjected? The legislature? The courts? The National Organization of Women? Forget it. By contrast, the outhouse invites abuse, forever turning the other cheek, so to speak. No one is denied access (save during prior occupancy) and never does an outhouse seek revenge upon even its most rank defilers... well, hardly ever. My Gramma Susie told of when she as a small girl took her pet piglet into a two-hole biffy, only to have it dive through the adjacent orifice. Even then there was a happy ending  for the pig. Gramma said little of the heroic efforts required to save the swimming swinelet, but pronounced he was retrieved and lived out his full life span. Seems few aspired to dine on sewage-marinated pork. Theres much more I could say about outhouses, but if youve ever used one youve probably already said it  perhaps in the howl of anguish elicited by the mortification of 98.6-degree flesh abutting minus 50-degree plywood? Or possibly an appropriate expletive torn loose upon the realization that the Sears Roebuck catalog had been stripped of all but its slickest pages? Of course, like most other institutions, with times passage even the outhouse has not escaped character-corroding modifications. These make visitations of yesteryear seem all the more heroic: Styrofoam seat covers now often insulate ones nether-parts, and a more parsimonious Sears no longer supplies free toilet tissue. Instead, most biffies come equipped with rolls of T.P., often in effete pastels. Youve gotta admit, if youve never used an out-house, it will definitely be something to write home about. and Graphic Arts Center Publishing Company, Copyright © 1996.